The recession towards the latter half of the 1980’s, when the oil prices tanked to $15 a barrel forced the Marek Family of Companies to look at other options in order to survive. They had to become a leaner and more focused company. Their change in plans to survive the recession was done by building apartments and condominiums throughout the eastern states. That meant having employees leaving their hometowns to travel to some eastern states for their work, but was necessary if the company was to survive. They came through the hard times and the 1990’s was a welcome for the company to get back to their normal routine of working in state. The company landed many impressive and challenging projects in each of their divisions doing the metal framework, hanging drywall, acoustical, painting, tiling, insulation in many hospitals, office buildings of all sizes, schools, condominiums, churches, nursing homes, retail centers, theatres, sports domes, stadiums, hotels, homes, and apartments. The company took some of the most challenging projects on because we had the talent to make sure the job was done. The 1990’s was truly a fascinating era, especially with the beginning of the Internet and the electronic age. It was the beginning of all kinds of gadgets. Bill Gates and Steve Jobs were the icons of the computer world and were fiercely competitive. Job growth was an economists dream, as well as for our beloved politicians. It was the era of spend and pay back later. The mood was good and as long as people had jobs, people loved spending, not caring of the consequences of spending over your limits. The general economic attitude for the 90’s was let the good times roll. Business was good and so were jobs. What did all this have to do with the Marek Family of Companies directly, well little, but indirectly, a lot? The economic climate of the 1990s was such that any company that was firmly established and in the right place and at the right time, could have made a fortune and the Marek Family of Companies, with their great leadership and talented workers in place, took advantage of this great opportunity. With confidence level high, local area banks were more than willing to let loose of their funds for capital improvements, of which the construction industry benefited immensely. During the 90s, the country experienced low and stable unemployment, high and stable growth, and a surplus in the federal government coffers. This all came together with the fundamentals out in place that permited prosperity for most of the population. Due to the stable inflation rates, no major shocks in the food and energy sectors, the decade had a good economic engine with very few problems. It was like the Little Engine that could. According to a Harvard professor, N. Gregory Mankiw of Harvard University, “It was pure luck that everything fell in place to create a booming economy.” But as things are going great, there always seems to be someone who learns how to take advantage of the situation for their own greed, instead of the good of the whole, they screw up a good thing for everyone else who is trying to make an honest living and do good things for others in need. The 90s also brought in a much discussed, so-called “new economy” and the increasing role in business of information technology. Computers and data storage was a revolution to the way we do things at work and home. It was like the invention of the automobile. With the growth of new inventories and technology, entrepreneurs and risk takers were the engines that got the economy going, there was an immense appetite for capital to make the dreams and ideas come true, which created the need for more offices, warehouses, retail stores, new homes, etc. It was a perfect scenario of the times, for a great economy. Let us not forget to mention the stock market. The performance of the stock market is an overall reflection of the macroeconomic events in our overall economy. A high return in the stock market, along with low volatility in the overall economy reflects the good acceleration in productivity growth, which in turn benefited corporate profits. The direction of the stock market is viewed by many as the driving force of the business cycle. The overall confidence level of the general population during this period was very high and at times thought of being too high according to Alan Greenspan’s comment of investors being “irrational exuberance”. The irrational emotions of investors that drove the stock market higher gave them the feeling that they were richer than they really were, which they found out later to be the case. Irrational behavior, when that is the case, never has a good ending. The overall healthy demand for goods and services, you need to consider money supply, consumer confidence, investor psychology, and the health of the banking system. We had all this to drive the economic stability and growth of the economy during the nineties, which we are now obviously lacking. The major metropolitan areas account for approximately 70 percent of Texas’ economy. During the 90s, Texas was growing faster than any other state in the nation. The industries that were growing were major players in the Texas economy. Dallas/Ft. Worth served as a trade center and distribution hub because of its central location to the state. It also had past ties to oil, defense electronics, and was the states telecommunications center. Austin’s higher education and high tech research contributed to its thriving business climate in electronics manufacturing and semiconductor industries. Houston had strong ties to the oil and gas industry, and its port made Houston a large partner in the international trade. San Antonio’s main attraction for the economy was tourism; River Walk, Sea World, and The Alamo, large leisure/hospitality and trade/transportation sectors, as well as the military bases; Kelly Air Force base, Fort Sam Houston, Lackland Air Force Base’s 37th Training Wing, and Randolph and Brooks Air Force bases. El Paso’s economy was tied to that of Mexican manufacturing and assembly plants (maquiladora industry). In the mid to late 1990’s, Texas proposed better than the rest of the nation in part because it had a large share of the booming industries. Texas employment grew at an average of 3.3 percent per year, compared to the national average of 2.1%. In the 1990’s, Dallas/FW had the second fastest growing workforce, next to Austin. At the peak of the high-tech boom, Dallas/FW accounted for 45 percent of the information technology employment. Some of the country’s largest telecom industries were based in Dallas/FW area. Austin’s phenomenal growth was tied to the high tech boom. During this period, construction employment grew at an average rate of 11 percent per year, reflecting the dramatic increase in population. Because of the increase in population, professional and business services, and retail rose dramatically. The Marek Family of Companies benefited greatly by the booming economy of Texas and so did the many charities that they contributed to, which benefited the community. The company was very generous to the needy and helped organizations that helped the poor. Even though there are those who are very fortunate and blessed with being able to create wealth, there are still those who do not or cannot fend for themselves for whatever reason. If you go to the pages of the websites that give information on each of the regional offices, they will list charities that they were involved in and contributed to their cause. Yücel, Mine, (1999). Southwest Economy. Regional Update. The Federal Reserve Bank of Dallas. Taylor, Lori L., (1999). Southwest Economy. Regional Update: Focus on the Energy Industry. The Federal Reserve Bank of Dallas. Dolmas, Sheila, and Yücel, Mike K., (1998). Southwest Economy. The 1997 Texas Economy Beats Expectations. The Federal Reserve Bank of Dallas. Dolmas, Sheila and Yücel,Mike K., (1997). Southwest Economy. 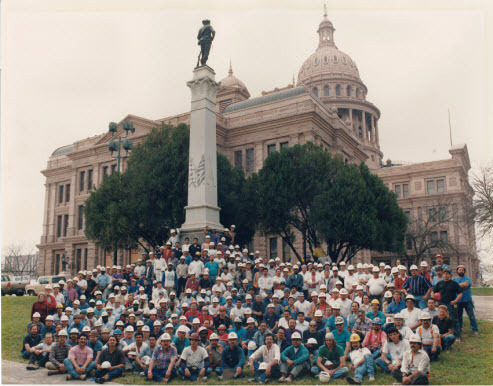 The Texas Economy: An Overview of '96 and Outlook for '97. The Federal Reserve Bank of Dallas. Clair, Robert T., (1995). Southwest Economy. Is the Southwest Lending Boom Too Much of a Good Thing? The Federal Reserve Bank of Dallas.